Hear Rogers 5.1 mix of “Death Parade” on Marilyn Manson’s new DVD. Teraplane signs to Maverick. Rogers produced their first album and other singles. Masson finds Blue Sky monitoring works at every stage of the record-making process for The Cribb's debut. 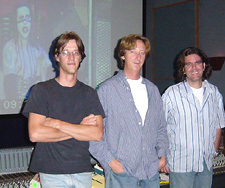 L-R: Marilyn Manson 5.1 DVD sessions with Patrick (ProTools op), Jimbo Barton(mixer), Rogers Masson(mixer), Ken Novak (PTools op) - at Larson Studios, Hollywood, CA; Teraplane; The Cribb's new cd is produced, mixed and engineered by Rogers Masson. History: Rogers is a Producer/Mixer focused on stereo and 5.1 surround music projects based in Studio City, CA. Rogers has produced and mixed music for a wide variety of artists easily moving between genres and styles from Rock to Bluegrass, Punk to Jazz. Clients include: Marilyn Manson, Teraplane, Reeves Gabriels, Superfix(Drain STH), The Crickets(w/Eric Clapton, Emmylou Harris, John Prine, etc. ), Ken Burns "Jazz", Phil Cody, Lars and the Bastards, Southern Culture on the Skids, The Hellecasters, Chuck E. Weiss, Dave Wakeling, The Uninvited, Candye Kane. Superfixx, Snake & Roger at Cherokee Studios. Blues artist Jimmy O at Castle Oak Studios, producer Rogers Masson, (front) engineer, Chris Spilfogel and assistant engineer, Hatch (back). Lisa Long (Trusting Lucy) Mastering session with Nancy Matter (mastering eng. ), Rogers Masson (producer/mixer), November 02 at Moonlight Mastering in Burbank, CA. Producer/engineer Rogers surrounded by The Cribb during the recording of their upcoming cd - the sessions were focus of a VH1 documentary. Current Credits: Rogers mixed in 5.1 the Marilyn Manson DVD “Death Parade” (EagleVision) from the Guns, God and Government World Tour, a 30 minute short film of the band's last trip around the world. 'The Death Parade,' directed by Manson, give the viewers an 'All Access Pass' to offstage life and a glimpse behind-the-scenes as the tour takes them from Tokyo to Berlin, Moscow to Rome, London to New York and everywhere in between. 'The Death Parade' includes rare footage from Manson's own cameras as well as guest appearances by Ozzy and Sharon Osbourne, Slipknot, Tammy Faye Baker, and Eminem as he and Manson perform 'The Way I Am' together onstage. The DVD, featuring over 100 minutes of footage, is offered in Dolby Digital Stereo, Dolby Digital 5.1 Surround Sound and DTS audio formats. 'Working on this extraordinary project with Manson has been great. This project will not only blow people's minds, it will set a new standard for artists using the DVD medium," says Masson. The video contains some of the most high end production values combined with the selects from 150 hours of the band's own footage from the tour. Masson also mixed 6 tracks for Superfix(formerly Drain STH) and mixed the Reeves Garbiels new project “Engine Room”. He produced and mixed Trusting Lucy's new CD Lightyear. He mixed and was the music editor for PBS's "The Smith Family." 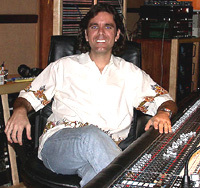 Masson used Blue Sky's Sky System One 2.1 and 5.1 monitoring systems to track, overdub, mix, and master the debut album for The Cribb, one of Los Angeles' hottest young rock bands. A Blue Sky Sky System One 2.1 monitoring system has been set up in a rented Spanish-style residential building in Los Angeles, a site the band members and Masson decided would make an excellent temporary studio, thanks to its acoustics and vibe. The Cribb's project is also the focus of a forthcoming VH1 documentary. Masson produced, mixed and engineered The Cribb's new release, The Wilson Square. Rogers also produced the 45EP for North Carolina local heroes, Senatobia. "They were always great to mix through, but it's clear that Blue Sky can handle every aspect of the recording process, which gives me and the band a tremendously enhanced level of sonic consistency throughout the entire project." -- Rogers Masson on Blue Sky monitors.